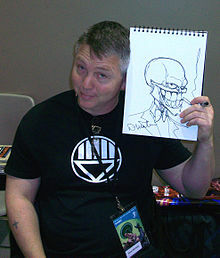 Douglas "Doug" Mahnke (/ˈmæŋki/) is an American comic book artist and penciller. Mahnke's first prominent work was for The Mask, and he has since worked for DC Comics on JLA, Batman with writer Judd Winick, and Seven Soldiers: Frankenstein with Grant Morrison. Mahnke's work on Batman included the controversial story detailing how the previously deceased second Robin, Jason Todd, was alive and actively working against Batman's interests as the Red Hood. Mahnke also worked on the critically acclaimed prestige one-shot Batman: The Man Who Laughs with writer Ed Brubaker. His work also includes titles such as Major Bummer, Superman: The Man of Steel, Team Zero and Justice League Elite. He was the original artist for the Dark Horse Comics title X, a run inked by Jimmy Palmiotti, as well as being the cover artist for King Tiger/Motorhead, a two-issue series set in the same universe as X. In 2005, with comic book inker Tom Nguyen, Mahnke produced two comic book art instructional DVDs. In 2006, he took over the art for Stormwatch P.H.D. for Wildstorm Comics. His work in 2007 included the DC mini, Black Adam: The Dark Age written by Peter Tomasi, detailing Black Adam's mourning over his wife Isis and regaining his powers. In 2008, he reunited with Tomasi to pencil an issue of Nightwing for the writer. Mahnke was an important collaborator with writer Grant Morrison on DC's event series Final Crisis, pencilling the Requiem one-shot and the two-issue Superman Beyond 3D tie-in. Mahnke also pencilled the final pages of the main series' 6th issue featuring the "death" of Batman, and replaced artist J. G. Jones entirely on the series finale issue #7 over concerns of Jones' speed. Starting in July 2009, Mahnke became the ongoing artist for DC's Green Lantern with writer Geoff Johns, right at the beginning of the Blackest Night storyline. He drew The Multiversity: Ultra Comics (May 2015), the eighth issue of Grant Morrison's The Multiversity project. ^ Rogers, Vaneta (March 27, 2015). "Vivisecting Multiversity: Doug Mahnke on Ultra Comics". Newsarama. Archived from the original on September 14, 2015. In this week's world-hopping Ultra Comics chapter of Grant Morrison's The Multiversity, artist Doug Mahnke helped the writer define Earth 33 — the supposed "real" world, yet one that's clearly re-focused through the writer's mind-bending lens. This page was last edited on 28 November 2018, at 20:39 (UTC).